Nissan 240SX converted from carbon as an addon car, meaning no other car gets replaced. - Brakelight textures now work. - Fixed height: car floating. Import height_fix.nfsms in NFS-VltEd. - Fixed an issue with 1024x vinyls. 2- Copy the contents of one folder (1024x or 512x) depending on which version of vinyls you have. If you have stock vinyls, 512x should be fine. 3- With NFS-VltEd: File, Import -> ModScript. Select 240sx.nfsms and height_fix.nfsms. 4- Open NfSMW - ReCompiler.exe (located in "ReCompiler" folder) and run: FRONTEND -> FRONTEND, GLOBAL ->GLOBALB, LANGUAGE. 5- Copy FrontA.BUN to "FRONTEND" folder. Copy GlobalB.BUN and GlobalB.lzc to "GLOBAL" folder. And all the language files to "LANGUAGES" folder of the game installation folder. 6- For those who want the 350Z and Skyline together with the 240SX do the same steps (for the others too) but merge the contents of the ReCompiler folders of the respective cars and run as explained in section 4. 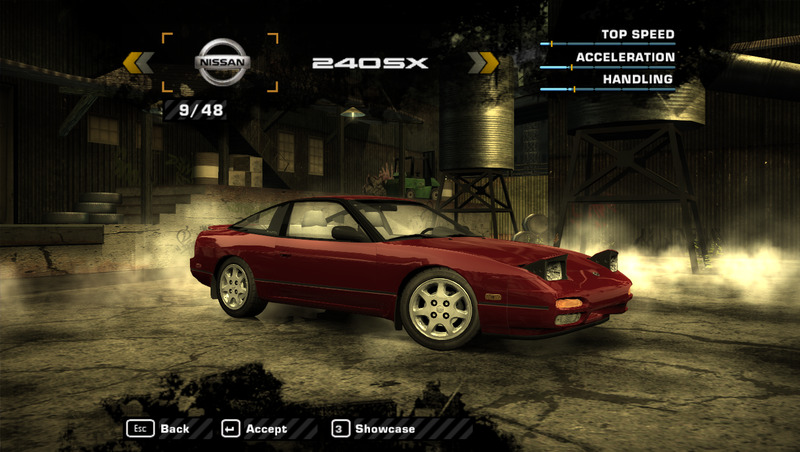 Example: the folder "ReCompiler\FRONTEND\Add\1" should have the files of the three cars "CARSELECT_MANUFACTURER_NISSAN" "SECONDARY_LOGO_240SX" "SECONDARY_LOGO_350Z" "SECONDARY_LOGO_SKYLINE". The folder "ReCompiler\GLOBAL\GLOBALB\Add\Cars" should have "240SX.ini" "350Z.ini" "SKYLINE.ini". The folder "ReCompiler\LANGUAGE" should have "CARNAME_NISSAN_240SX.ini" "CARNAME_NISSAN_350Z.ini" "CARNAME_NISSAN_SKYLINE.ini"
7- Make sure you don't have ModLoader. Run the game and make a new save. @Neon114 By fixing you mean adding bodykits etc? Or just make it playable in career?